Ideal for the leisure rider or urban transport the UCL-70 is a premium e-bike featuring the Shimano Steps Mid Motor system teamed with Nexus 7 internal hub gear system, Magura HS-11 hydraulic rim brakes and a high level finishing kit matched to a lithium ion 400wh battery giving a range of up to 75 miles and a sophisticated riding experience. Available in Lowstep frame style (that makes getting on and off much easier) with a comfortable upright riding position. Sizes S.M. Finished in Matt Electric Blue. 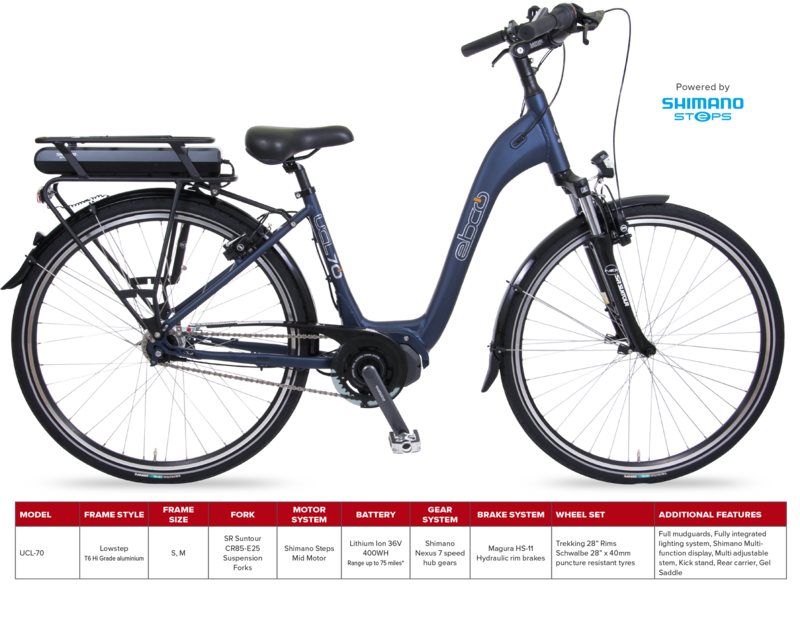 A Premium Sophisticated Low maintenance Shimano Steps e-bike. Urban City low step frame built in T6 high grade aluminum finished in Matt Racing Green and with Suntour CR85-E25 suspension forks giving a smooth comfortable ride. Lithium-ion 36V 400WH Shimano battery which locks securely and is removable for charging (charger supplied). Front and Rear lighting system with integrated reflectors and reflective sidewall tyres to give maximum visibility.